Some pros still install tile the old-fashioned way by pouring a thick slab of mortar and setting the tiles directly in it. But a mud job, as this technique is called, is a time-consuming operation that requires a practiced hand, and it increases the thickness of the floor or well considerably. That's why most tile setters now use cement backerboard 3-by-5 foot sheets that get screwed in place much like drywall and then topped with a thin layer of mortar to bed the tiles. This is a far easier process for the do-it yourselfer. You should lay 1/2 -inch-thick backerboard over any wood subfloor before laying tile on it. Cement backerboard must also be used for wall tile installations in shower surrounds. For bathroom and kitchen walls where the tile may see occasional moisture but not direct, daily contact with running water, you can use drywall or fiberboard instead of backerboard. In completely dry locations, you can simply install tiles directly on existing or new drywall or plaster. 1. Prepare the surface and start the layout. If you're tiling a wall in a wet area, remove any existing tiles and the existing drywall or plaster down to the studs, making sure to pull loose nails or sink their heads. If you're tiling a floor, remove old flooring and other debris from subfloors. Then plan your layout. Starting in the corner, place the first sheet of cement backerboard. Use strips of 1.4 inch plywood to create a gap around the perimeter of the surface, and make sure the length of the sheet crosses the joists in the floor or the studs in the wall. The tile side of the sheet (which is the rough-textured side) will be identified on the product label and should face outward. Plan the layout so that none of the backerboard joints fall directly over joints in a plywood subfloor. Stagger backerboard joints by 18 inches or more, so that there is no place where four corners meet, and keep a 1/8 inch gap between backerboard sheets. For walls, you'll need to cut the sheets to end at the center of the studs so that you can fasten them, but for floors, you can fasten the ends of the subfloor wherever they wind up. 2. Score the cuts. To cut a sheet of cement backerboard, measure for the cut and subtract 1/4 inch, since the cut end will be rough, with jagged bumps that will jut out beyond your cut line. Make your mark at both edges of the board and hold a straight 2x4 between them. Mark the line with a carbide-tipped cement board knife. Then, pressing hard enough to hear the blade tearing through the cement, make about 10 more passes along it to score a 1/16-inch-deep groove. You can use a standard utility knife, but be prepared to change the blade after every cut. 3. Snap and cut again. Slide the 2x4 under the sheet and align it just under the score line. While holding one side of the sheet firmly, press down on the other to snap the board along the cut. Stand the sheet on its edge and make a pass with the knife from the back to make the final cut. Use a rasp, a tile stone, or the rough finish of a cinder block to, smooth any rough sports so the sheet can sit tight against its neighbor. 4. Make cutouts. To make holes for pipes to go through, you'll need to use a 1/2 inch drill loaded with a hole saw. For other odd cuts, you'll need to use an angle grinder, rotary cutter, or circular saw with the masonry blade. Wear a respirator when cutting the sheets with power tools, as you'll make a lot of cement dust that's unhealthful to breathe. You can also make a 1-inch hole for standard plumbing pipes by hitting the board hard at just the right spot with a hammer and then cutting away the debris with a backerboard knife. Sometimes, it's more economical to opt for handyman remodeling instead of performing things on your own. With local handyman, you will have less trouble in getting things done according to your budget. Like most people living up in the North East, waking up to find our car and SUV laden with heavy snow is a frequent occurrence. It's such a drag going outside in the cold dark mornings to remove the deposit of the latest winter storm from your vehicle. If you're like me you don't want to spend one second more than you have to outside in the cold. We have gone through a bunch of snow brushes that couldn't take the constant strain of the snowy weather. They would bend and break or the bristles would become damaged and drop out. It took us a while to find one that was up to the job, so when we did we were really pleased with it. The "Ice Blade" from Arctic Warrior is a strong and robust snow brush with an unbreakable ice scraper. It is made from really high quality materials with a long heavy-duty plastic shaft that is definitely built to last. The tool works so well! We found it easy to brush off snow even after a heavy snowfall. The snow brush is long enough to reach across the windshield of our car. It doesn't reach the whole way across on the SUV, but we don't mind walking around to the other side. Although it's long, it fits easily under the driver's seat or in the rear seat, or in the trunk for that matter. Another feature that we love is the soft foam grip that prevents the snow brush dropping from your hand into the snow, and is always warm to touch even without gloves! We got our "Ice Blade" on Amazon. It arrived real quick and in great condition. The seller will shoot you an email as soon as your product is shipped, so if there's an issue with your order you know who to contact for help. 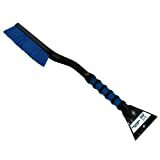 If you're tired of the chore of clearing off car snow and ice, and you've been disappointed in the past by low snow tools then I really recommend you pick up one of these super handy snow brushes from Arctic Warrior. Let's face it, it won't change your life. But I'm sure you'll be glad you did on those cold winter mornings when you're rushing for work or last minute holiday shopping! Use the ICE BLADE to clear off thick snow and ice in a hurry. On cold winter mornings you don't want to be outside in freezing conditions for one minute longer than you have to. After a snow storm, you need to clean that thick snow and ice off quickly, and hop in your warm car. Clearing snow and ice fast gives you the freedom to get on the road and get where you're going: work, shopping, visiting family or meeting friends. If you have ever bought a cheap, flimsy poor quality car snow brush you'll know how annoying it is when it lets you down when you need it most. This snow brush will stay intact and in good shape and the ice scraper won't chip on hard ice. This sturdy tool is built to endure many harsh winters and will always be ready for the next snow storm. If you use the snow brush as intended and it becomes broken, then simply return it to Amazon. We will reimburse you the purchase price. Keep it under the driver's seat, the passenger seat, the back seat, the door compartment, the rear shelf, or in the trunk. It's long enough to reach right across the windshield of most cars. DON'T HESITATE - ORDER NOW! Now you know why this is the ultimate snow brush and ice scraper for you. It's time to click the "Add to Cart Button". We'll ship your Ice Blade to you right away in protective packaging. And don't worry - our support team will be on hand to answer your queries. With easy access to the Internet, there should no reason not to be an informed used car buyer. Whether you want to learn more about used cars, used car sellers or the used car buying process, you can obtain the information on the Web. However if you've ever shopped for a used car before, you would know that this might not be enough to get a really good deal in your used car purchase. There are lessons or tips that many tend to ignore, thereby preventing them to get the fullest potential from the purchase. If you are gearing up to shop for any of the reliable Atlanta used cars, then it's in your best interest to learn and follow them. These are crucial when dealing with a salesman. Prepare yourself well before coming to the dealer. Preparation, in this sense, is not only about doing your research. You need to get ready, physically, too. Keep in mind that you have no idea about what would happen. Interacting with a dealer can mean spending a long and hard time, and if you don't feel well or you're hungry, you might be making a decision you would regret. In addition,, you should condition your mind too. First, commit to avoid any thing that could make you spend more than what you can afford. In the same way that you can look online to check on your car options, you can also check online for an online calculator that can help you set your budget. However, you should know that setting a budget and sticking to it are two different things. Second, you should try not to be emotionally attached to a car because a salesman would know this and can use it to his advantage. Also, try not to answer every question he throws as your controlled silence can send a message to the salesman that he is not in control, thus, compelling him to act his best. Apart from this, you should not attempt to shop for a car alone. Have your partner or friend accompany you. But make sure to choose someone who is not an impulsive shopper himself. You would benefit from someone who can help you avoid car buying pitfalls and not someone who can drag you to it. In addition, you should be wary of the usual tactics salesmen use. Don't be pressured when you hear him say that somebody else came earlier for the same car. Bear in mind that you can always go to Hertz Car Sales for another car. In the same way, try not to be disturbed when the salesman says he is taking your offer to the manager. Let him be, but stay focused on what you want to get from the negotiation. Searching for a reliable seller is an important factor when you are planning to purchase a used car for yourself. There are plenty of horror stories about buyers ending up with a lemon car that ended up costing them more in the long run because of the constant repairs needed to keep them running. Make sure you avoid that by only checking out sellers who are reliable when it comes to providing quality used cars for sale. It should be well worth your time to research which sellers have garnered high customer satisfaction ratings in relation to the quality of the vehicles that they have purchased from them. You can also visit the websites of these sellers if they have any, giving you access to info about the sellers and what they are offering in the used car market. Click here to find out one of these sellers that you can visit for used car options in San Francisco. This is so you know the venue you can visit when it's time to check out the used car options in person so you can make the final purchasing decision. It helps to find out what a leading dealership can offer when you are looking for a used car. The Hertz Car Sales company is a trusted used car seller by many people, offering a range of used car models that are all in good running condition. With the knowledge that you are only considering quality options, you will find car shopping with the dealership all that much more fun, especially since they are also known for offering a wide range of model options. You can use the dealership's website to go through their lineup and even narrow down those options so that you only have to consider cars that exhibit the features you are looking for. The site's search section can provide you a list of models that fall under your preferred year release, model, make, vehicle body type, price range and mileage range. Trimming down the search results list is also easy when all you need to do is select among the features like car color, engine type, fuel type, fuel economy, transmission type and wheel drive type. If there are models that you are close to deciding on buying, you might want to check if you can test them first with the dealership's Rent2Buy program. You will find that it's easy to sign up for the program, as well as learn about what measures the dealership takes in order to provide you with quality options. The information found on the site should more than prepare you for your branch visit.